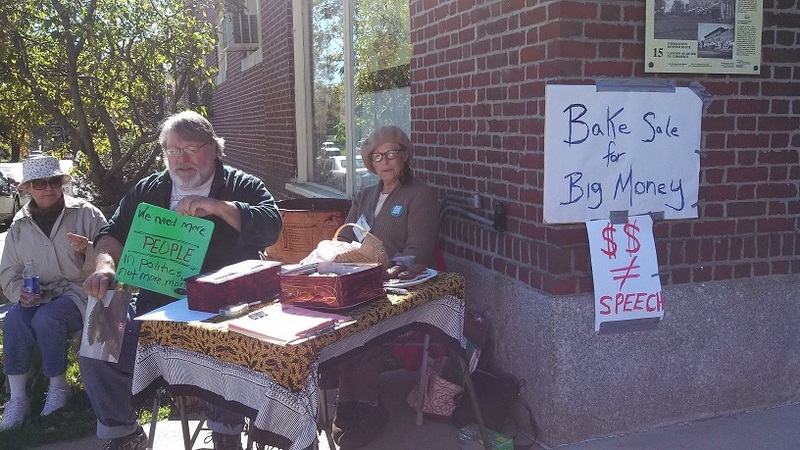 With the Supreme Court hearing arguments on McCutcheon v. FEC today, one of the most important money-in-politics cases since Citizens United, members of the Maine People’s Alliance held bake sales at locations across the state to call attention to the case and the corrosive influence of wealthy, out-of-state donors on Maine politics. The McCutcheon case is a challenge to aggregate contribution limits – limits that cap the total amount any one donor can give to federal candidates, party committees, and hard money PACs in a single election cycle. In 2012, that limit was $117,000. If the Court sides with McCutcheon, it would strike down the total federal limit of how much one person can give to political campaigns and possibly state limits like Maine’s as well. According to state-level research released by MPA and Public Campaign, Maine saw 140 out-of-state “McCutcheon donors,” elite donors who contributed $105,300 or more to federal candidates, parties or PACs, contribute $331,756 to Maine candidates and state party committees in 2012. A ruling in favor of McCutcheon would only dampen an already faltering trust in government. The American National Election Studies’ 2012 Trust in Government survey found that 86 percent of Americans are worried about corruption of government, and 82 percent of Americans are worried about special interests buying elections – several percentage points higher than the previous 2008 survey. Read the fact sheet on out-of-state McCutcheon donors in Maine here.